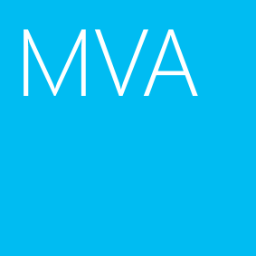 By default, KCC doesn't manage the manual connection objects which were create by an administrator. I read the post "You Are Not Smarter Than The KCC" which talked about the advantage of using KCC generating connection object and how to the manual connection object. I will show you the step to update the manual connection object by KCC. 4. 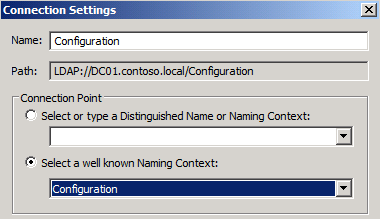 Select "Select a well known Naming Context > Configuration". 6. 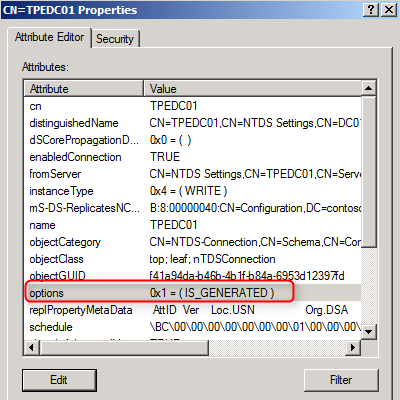 Expand "Configuration > CN=Configuration,DC=<Domain>,DC=COM > CN=Sites > CN=<Site Name> > CN=Servers > CN=<Server Name> > CN=NTDS Settings". 7. 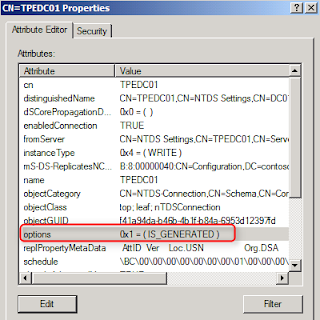 At right pane, right-click the manual connection object, select "Properties". 8. Next to "options", click "Edit". 9. Type "1", click "OK". 12. Either wait 15 minutes or run "repadmin /kcc" to update the result.